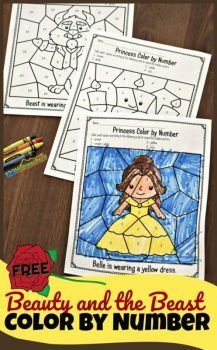 If you have a child who loves Disney movies and especially Beauty and the Beast, they will love these Beauty and the Beast Color by Number Worksheets! Color by number sheets are very useful for practicing colors, number recognition, AND fine motor skills! Five different worksheets are included in this resource from Beth at 123 Homeschool 4 Me! Click here for other Disney resources! Click here for other color by number activities! Get the Beauty and the Beast Color by Number Worksheets here!